I finally made my first order with Glossier to see what's that hype all about! 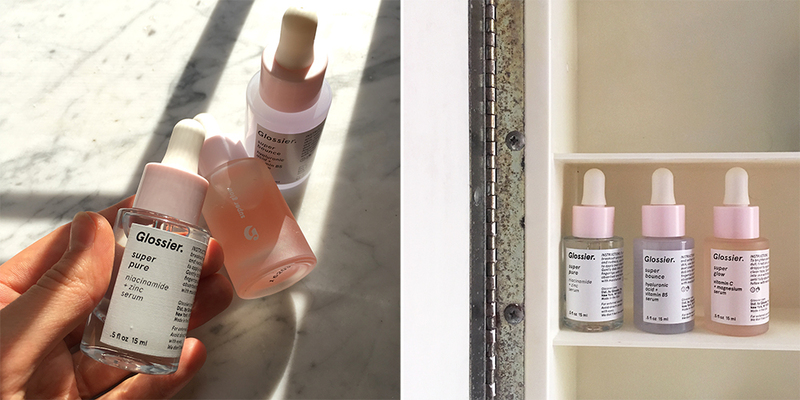 If your not familiar, it's a relatively new skin care and cosmetics brands created 2 years ago by Emily Weiss, the founder of popular beauty site IntoTheGloss.com. That New York based brands really stands out in the midst of hundreds of beauty companies.They just get it all right - marketing, social media, visuals, positive message with a dose of humor, product design and packaging. That being said, the products arrived in a pink box, wrapped in pink bubble wrap and with cute complimentary stickers. I decided to try out their The Supers - a set of 3 skin serums for different skin needs. I always been frustrated with buying products that are divided just by skin types, because it feels different every day. Super Glow for a dull face after an all-nighter, Super Pure to fight with breakouts and Super Bounce for that dry and tight skin after a long flight or a night out. After two weeks of using, I am really happy with the purchase! Not implying that they're absolutely irreplaceable but still a nice addition to the skin care routine. My situation with breakouts is definitely a lot better now and all the super dry chapped areas have disappeared.